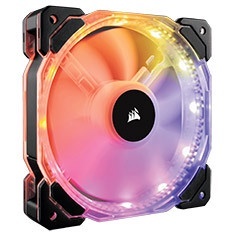 The Corsair HD120 RGB LED PC case fans combine 12 independent frame mounted RGB LEDs and excellent air delivery, bringing a stunning element to your rig. The HD120 is PWM controlled and pushes up to 54.4 CFM, while producing up to 18-30 dBA at 800 - 1725RPM. This package is an expansion of Corsair’s HD120 RGB LED fan kit that includes the RGB LED hub and controller.